Between 1801 and 1865, South Carolina College owned a number of slaves and employed countless others. It is difficult to locate information about the majority of these people as college records rarely listed names or identifying information about individual slaves. In most cases, we do not know who these slaves were, what labor they performed, or where they lived. Although slaves made significant contributions to the construction and maintenance of the college and to daily life on campus, whites frequently regarded slaves as an invisible part of the landscape. In providing the following list, we remember the slaves who did appear by name in the college records. This list is by no means complete, but it represents a preliminary effort to honor the slaves who built South Carolina College and, by extension, the University of South Carolina. Jack (1) was first hired by the college in 1810 and was purchased in 1816. He worked primarily in the laboratory until his death in 1822. Professor Thomas Cooper purchased Sancho and his wife (not named in Cooper's records) in 1819. The couple worked on campus until Cooper resigned in 1834. Sancho and his wife gained their freedom after Cooper's death in 1839. The college purchased Jim (1) in 1828. He worked primarily in the laboratory. The college purchased Henry in 1829. He ran away in August 1833, but was soon captured. He was sold in November 1833. The college purchased Jim (2) in 1829. Professor Thomas Twiss hired Lucy at some point between 1835 and 1846. Professor Lieber hired "Little Tom" in 1836 to work in his home on campus. Tom was 14 years old. Marshal J.G. Self hired Charles to clean campus wells in August 1837. The college hired Joe (1), a brick mason, to repair campus buildings between 1837 and 1839. 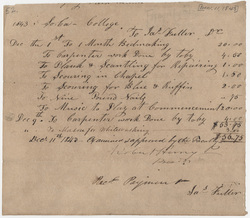 The college hired Joe (2), a carpenter, in March 1839. President Barnwell owned Toby and hired him out as a carpenter for campus building projects during the late 1830s and early 1840s. President James Thornwell owned Amanda. She likely lived on campus between 1851 and 1855. Simon was hired between 1855 and 1860. Marshal W. B. Broom hired Tom and Henry between 1858 and 1860. Marshal W. B. Broom hired Mal., Anthony, Abraham, and Peter between 1858 and 1860. Marshal W. B. Broom hired Jack (2) between 1858 and 1860. Hired in 1846 as a washerwoman.